Many who want to safely view Aug. 21's total solar eclipse will turn to paper eclipse glasses. Astronomers Without Borders is providing more than 100,000 of them to people in underserved communities. The total solar eclipse on Aug. 21 is just around the corner; to make sure skywatchers can view the event safely, Astronomers Without Borders (AWB) will provide over 100,000 free solar- eclipse-viewing glasses to underserved communities across the United States. The eclipse, also called the Great American Total Solar Eclipse, will sweep across the continental U.S. from Oregon to South Carolina along a stretch of land about 70 miles (113 kilometers) wide. Skywatchers in the path of totality will see the moon slowly pass in front of the sun. Viewers outside that path may see the sun partially covered. "This eclipse is historic, with a huge effort underway by organizations across the country to prepare people for the experience and use this rare opportunity to teach science," Mike Simmons, president and founder of AWB, said in a statement. "We're very pleased to be able to provide access to eclipse viewing to those who might otherwise miss out, thanks to the generosity of our sponsors." The AWB giveaway was funded by donations from Google (50,000 glasses), Big Kid Science (50,000 glasses) and the American Astronomical Society (3,200 Eclipse Megamovie project glasses), according to the statement. The public can also purchase special solar-eclipse-viewing glasses from AWB, and all sales will support the organization's international grassroots science outreach programs. 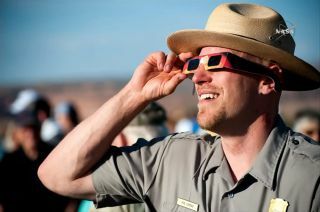 Organizations serving underserved communities can apply to receive eclipse glasses by visiting the AWB Glasses Giveaway page. Warning: Looking directly at the sun without the proper eye protection can cause serious eye damage or blindness. During a solar eclipse, the moon passes directly in front of the sun. However, for most of the process part of the sun's disk is still visible, and the intense sunlight can burn your eyeballs. That's why it's important to choose solar eclipse-viewing glasses that are safe and effective at blocking harmful radiation from the sun.